Vintage Fifties Spadea sewing pattern by Battilocchi of Italy. 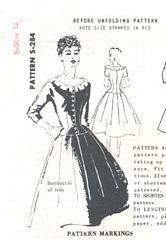 Dress with dropped waistline and front button bodice. Sleeves in short or three-quarter length are cut-in-one with front waist and back waist. Unique cog shape collar frames the bateau neckline.